Complete Left Hand ejecting AR-15 upper. Complete ready to fire upper with your choice of barrels, 12″ mid-weight, 16″ light weight, 16″ mid-weight, or 18″ light weigt. The standard upper with no options includes a complete bolt carrier group, charging handle, mid-length plastic GI hand guards, and Tromix muzzle brake. Many other options available. 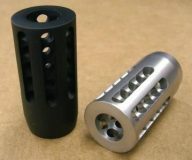 Barrel muzzle is threaded 11/16-24 with a twist of 1:24. This upper with an 18″ light weigit barrel on a standard M4 style lower will result in a complete rifle weight of 6.1 pounds.